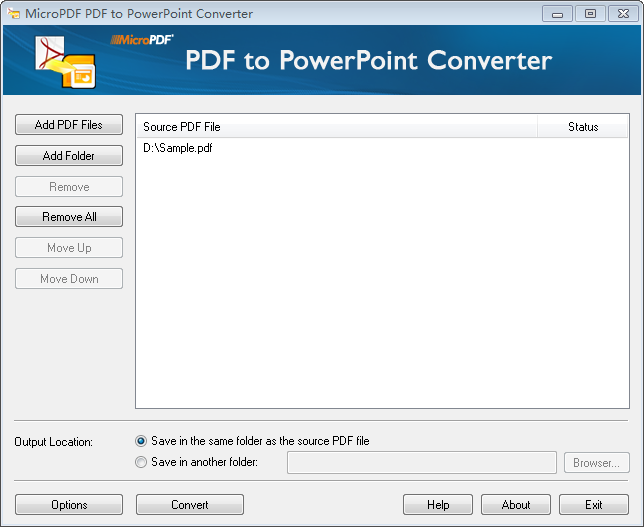 MicroPDF PDF to PowerPoint Converter 8.1 Free Download - fast convert pdf to powerpoint (pdf to ppt) with outstanding quality. want to convert pdf to powerpoint (pdf to ppt) for reuse? micropdf pdf to powerpoint converter is your best choice! it is the smartest desktop utility to produce powerpoint presentations from pdf slides in just a few clicks. after conversion, editing, reusing, or preservation of pdf content is really easy for you!
? convert read-only pdf files to fully-formatted and editable powerpoint presentations, preserving all the text, images, tables, hyperlinks, layout and format from the pdf files.
? support exporting powerpoint 2003, powerpoint 2007 and powerpoint 2010 formats ( .ppt, .pptx).
? convert the pdf directly without entering the password if the pdf is protected by owner password (protect pdf files from editing, copying and printing).
? require users to enter the user/open password if the pdf is protected by user password (protect the files from opening).
? batch conversion: convert unlimited pdf files at one time.
? partial conversion: select any pages from the pdf file to convert.
? add a mass of pdf files and convert them to editable and dynamic presentations with several clicks.
? support drag-and-drop operation, easy to use.
? standalone, do not require adobe reader or acrobat.
? support pdf files in english, german, french, italian, japanese, chinese, turkish, etc. convert pdf to word (pdf to doc) with high quality..
a professional pdf to excel converter that converts pdf to xls with great qualit.